Hooo boy, was I on a creative roll these couple of weeks! 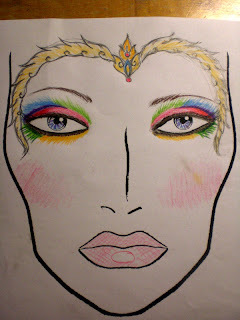 This is my third and final entry to Mizz Worthy's "Myths & Legends" contest, sponsored by Illamasqua. My brain (and skin o_O) is definitely breaking down by now so this will probably also be my last entry to this blog for a while. I need a break to fight the flu! 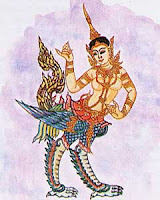 In Southeast Asian mythology, Kinnaris, the female counterpart of Kinnaras, are depicted as half-bird, half-woman creatures. One of the many creatures that inhabit the mythical Himavanta. Kinnaris have the head, torso, and arms of a woman and the wings, tail and feet of a swan. She is renowned for her dance, song and poetry, and is a traditional symbol of feminine beauty, grace and accomplishment. - Gold Cardboard for the hair ornaments and "claws"
I wanted to do a multicolored fun look for my final entry, so I decided to go crazy on the eyeshadow and used rainbow shades. 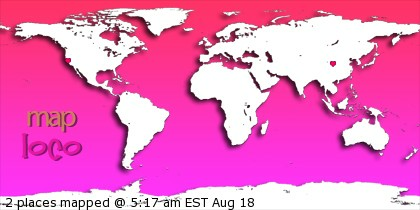 It's too bad the gradients do not show up that well in photos. 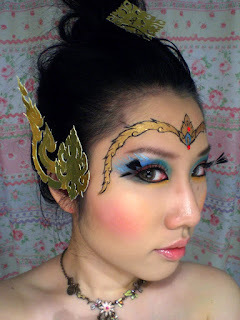 I drew the forehead design by painting on the gold base first, then carefully trace out the black lines with the black liquid eyeliner. No stencils were involved! 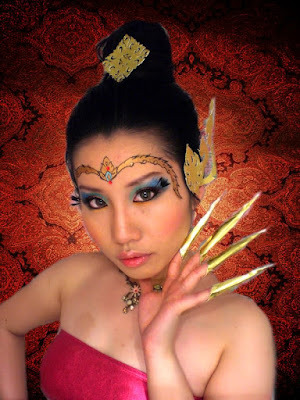 I love the silly gold "claws"! 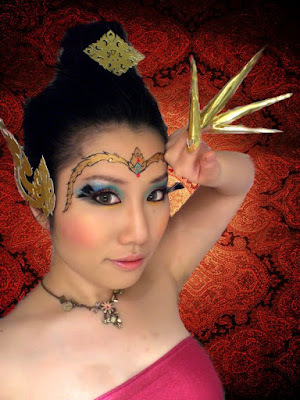 They are inspired by the Thai dancers, which used them to exaggerate hand gestures. 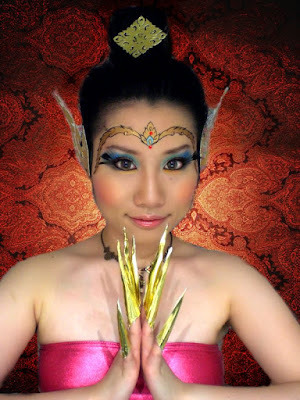 I made them by cutting out gold triangles, decorating the edge that goes on my fingers, and taping them into cones. 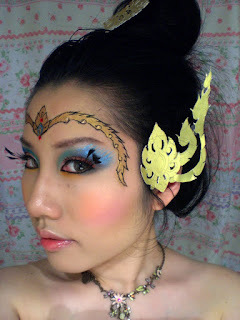 The hair ornaments are drawn on normal paper first, then the pattern is transferred to the gold cardboard by placing the paper on top and tracing hard with a ball-point pen. I then cut it out and made the little holes using an exacto knife. There are also little cut-out bits on the "claws" too! I am wearing the orange blush nearer to my nose, and the pink blush nearer my ears. There is also seven eyeshadow colors on my eyes! The false eyelashes are super-fun, albeit a bit heavy. I like how they flutter when I blink. 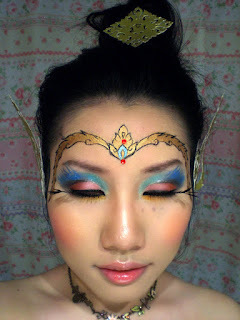 I wish I can have the real hair ornaments in gold cus they are so gorgeous, but i bet they cost a ton. I hope you enjoy my rapid-fire entries the past week. Wish me luck in the contest, and I will see you guys after my break! Wow! Another FAB entry! Love it - you clearly went to a load of effort for all your entries so thank you!